Universitarios de Panama (LPB) added to their roster 28-year old American center Kwame Alexander (201-109kg-90, college: Cal State - San Bernardino). 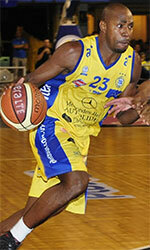 He played last summer at Trotamundos in Venezuelan LPB league. In 14 games he had 11.1ppg, 7.3rpg, 2.1apg and 1.4spg. Alexander helped them to make it to the final after they ended regular season as second best team. The last season he played at Goes (LUB) in league where in 25 games he recorded very impressive stats: 18.2ppg, 9.5rpg, 1.7apg and 1.3spg. He was also named League Player of the Week. Alexander is quite experienced player. His career allowed him to visit four different continents, while he played in ten different countries. 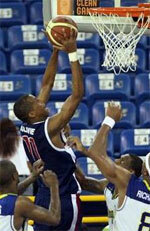 Alexander tasted the life as pro basketball player in Europe, Asia, Latin America and of course North America. He has played previously professionally in Bosnia (Capljina Lasta), Cyprus, Finland (BC Nokia), Greece (Aiolos Trikallon), Japan (Aomori Watts), Philippines (NLEX Road Warriors), Qatar (Al Rayyan), Taiwan, South Korea (LG Sakers) and Thailand (Hitech). Alexander attended Cal State - San Bernardino until 2013 and it will be his sixth season as a professional player.